Peppefry, one of the famous online store, is selling Diva Georgette Saree worth Rs 1039 from Rs 799. But you will get further discount of Rs 350 as we are giving you a coupon code to get Rs 350 off on purchase of Rs 750 & above. How to get Diva Georgetter Saree starting Rs 449? Note: To use the coupon code you must Register. This is for new accounts. As you all are aware that Yebhi is running a promotional offer where they are giving Rs 100 off on purchase of Rs 249 & above. So using this coupon code we can get Hanes Women's Briefs set of 3 worth Rs 259 @ just Rs 159 only. How to get Set of 3 Hanes Briefs worth Rs 259 @ Rs 159? We have posted a great deal of Set of 8 Towels yesterdays, Now we have another great deal from Homeshop18. Get HomeSmart 60 pcs Melamine Dinner Set worth Rs 4500 + Princeware 17 pcs Storage Set worth Rs 460 for just Rs 1680 only if you follow the below steps. 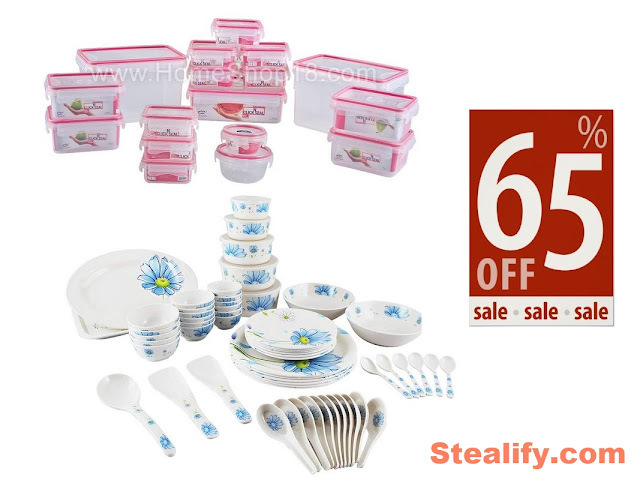 How to get 60 pcs Dinner Set + 17 pcs storage set at Rs 1680?